Yes, Italians make meatloaf. They call it polpettone, or a ‘big meatball’, which is, in fact, what it is if you think about it. It’s made from essentially the same mixture of minced beef and pork (and optionally veal), lightened with bread and flavored with garlic, cheese and parsley that you would use to make polpette, or Italian meatballs. Mix all the ingredients together very well—you’ll need your hands for the job—until you have an evenly amalgmated mixture. Form into an oval loaf. If you want to, open up a fairly deep well in the middle of the loaf and add slices of mozzarella or another meltable cheese like scamorza. Close up the well and reform the loaf. Now place the loaf in a baking dish. Toss the potatoes, along with a few cherry tomatoes or wedges of regular tomatoes, with olive oil, salt and pepper in a mixing bowl until the potatoes (and tomatoes if using) are well coated. Pour them around the meatloaf. Splash on a bit of white wine over everything. Bake in a hot oven (200 C, 400 F) for 45 minutes to an hour, tossing the potatoes and basting the loaf from time to time with the cooking juices, until the polpettone is nicely browned and the potatoes are tender and just lightly spottled on the outside. The potatoes are done when you stick a knife in them and the potato stays where it is when you lift it out. Serve the polpettone whole, if you like, directly from the baking dish for a ‘family style’ meal, or slice it attractively on a serving plate, surrounded by the potatoes. Either way, don’t forget the cooking juices, which are absolutely fabulous. There will be little bits of coagulated milk floating around. They may look unattactive but they really delicious. If you want to be fancy, you could smooth out the sauce by either sieving or blending it. If you prefer, the polpettone can be made entirely from beef, or I suppose entirely from pork. I would think that a veal-only meatloaf would be rather bland—and expensive! In some Neapolitan families, raisins and pinoli are added to the meat mixture, but Angelina never did and, frankly, the idea doesn’t appeal to me. Besides cheese, there are a variety of stuffings that you can try out. Some common ones include vegetables like spinach, mortadella, prosciutto and hard boiled eggs, but really, you should feel free to use your imagination and suit your own taste. The possibilities really are endless. It is very common for Italian recipes to call for browning the polpettone on all sides in butter or oil in a Dutch oven and then simmering it, covered, on top of the stove. I’ve tried it that way and the initial browning can be tricky—it is all too easy for the polpettone to break apart when you turn it. See my other post on polpettone braised with tomatoes and mushrooms for an example of this technique, which gives you get a delightful sauce to serve with the loaf or to dress pasta. Artusi, by the way, has two recipes for polpettone. One calls for leftover boiled beef but is otherwise quite similar to this recipe. The other, which he dubs alla fiorentina or Florentine style, calls for a mixture of minced veal and ham; the loaf is simmered in broth, which is thickened with a egg yolk mixed with lemon juice. (This is a technique that is quite common in Italian cooking, which some say has Greek origins.) Artusi even mentions in a short note polpettone alla piemontese, stuffed with hard boiled egg. Non è un piatto da disprezzare (“It’s not a dish to turn down your nose at”) he says, and I would definitely agree. As mentioned, this same mixture is the stuff for making polpette (meatballs). They are wonderful on their own, fried in oil, simmered in a Sunday Sauce or, made particularly small, as stuffing for a Neapolitan-style Lasagna di Carnevale. Mix all the ingredients together very well—you'll need your hands for the job—until you have an evenly amalgmated mixture. Form into an oval loaf. 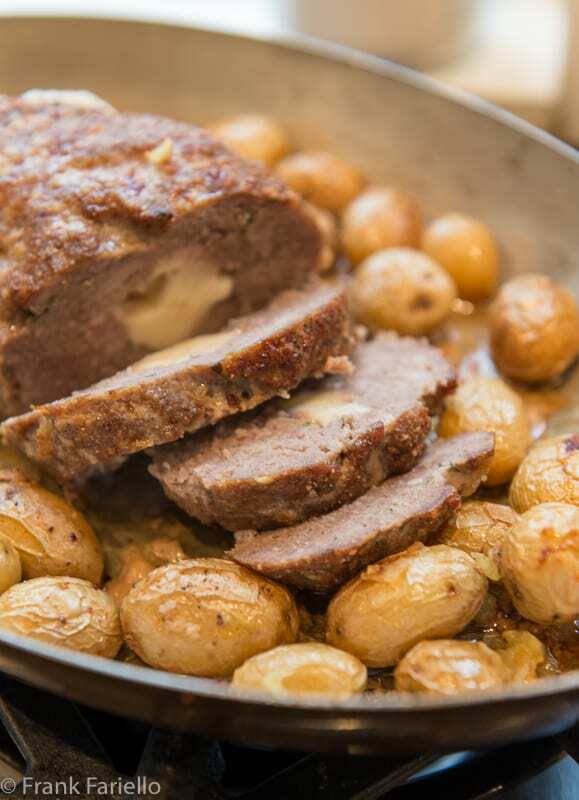 Serve the polpettone whole, if you like, directly from the baking dish for a 'family style' meal, or slice it attractively on a serving plate, surrounded by the potatoes. I am literally drooling over this Italian meatloaf as I am typing this. The addition of cheese in the middle is such as nice touch. It’s amazing how every culinary culture has its own way of making meatloaf yet they all taste fantastic (at least of all the varieties I’ve tried so far). Great recipe! Thanks, Yi! You’re right, it’s hard to go wrong with meatloaf. Oooh, wow! My Italian great aunties never served anything like this! I have to admit though, I am curious about the raisins & pine nuts. I greatly enjoy those flavors with ground meat, perhaps Cuban influence from my former in-laws, as you find them in traditional picadillo. How many of each do you think? 1/2 cup, perhaps? I would assume white/golden raisins. Yep, 1/2 cup each would be plenty, I think. And personally I’d tend to use dark raisins, but I’m sure the golden ones would work fine. It appears my first comment vanished before publishing…your meatloaf with the roasted potatoes sounds great. I know my husband and I will enjoy it. My husband and I love meatloaf prepared lots of different ways. I’m definitely trying your version sounded with the potatoes, it sounds so tasty. So glad you liked it, Maggie! I have to say, my mother made an Italian meatloaf once, and it was the only one I ever liked! Yours would probably me in the same category, Frank! Looks wonderful, but I have to say, I don’t like the US version. I love the ideaof cheese at the center. Also of potato wedges. Every country has their own version of meatloaf. Years ago I befriended an Italian postman and we tried to come up with a meatloaf recipe we liked the best. I think your recipe would have been a winner. The oozing mozzarella would do it for me. How does the milk get in the recipe? I don’t see it in the ingredients although the sister recipe for meatloaf with tomato sauce and mushrooms has milk. To be precise, I should probably have said “milky liquid” or something rather than milk. A fresh mozzarella will exude some of its liquid while the loaf is baking in the oven, seeping through the meat and into the baking dish along with the meat juices. My relatives in Italy make it with the egg in the middle, but I much prefer it this way, with that oozing cheese. I have another Italian friend who grinds a bit of mortadella in her meatloaf – also delicious. Thanks, Linda! I really like the idea of mortadella—I can imagine it adds a lovely flavor. I made this tonight and it is fantastic! I did make two alterations. First, I added a glaze (1/2 C catsup, 1/4 C brown sugar, and 4 TBSP cider vinegar) to the top before putting in the oven. Second, I found that it needed an additional 20 minutes to complete cooking (both thends meatloaf and the potatoes). The mozzarella filling is an awesome innovation on meatloaf. Thanks for your comment, Karl! So glad you liked the dish. Wonderful recipe and it reminds me of my own grandmother’s polpettone. Actually, this variation is my favorite, although I have dabbled with some changes over the years. I have said this before, but we are often on the same wave length; during the month of January I experimented with an all veal polpettone without cheese, I am very pleased with the results and should be posting it soon. Thank you for such complete background information as always. It really does sound like we’re in sync, Paula. 😉 I’ll look forward to reading your recipe for veal polpettone. As I speculated in the notes, I always thought that an all-veal loaf would come out a bit bland, but I’d be more than happy to learn my guess is proven wrong. Mama mia! What an excellent dish! :) Bravissimo Frank, delicious looking meatloaf! Did you ever tried this with some fresh spearmint? Looks just perfect, Frank! Nonna Tolaro put the eggs in the center of hers, and I always hoped I would get a slice with the yolk! I’ve tasted several versions of meatloaf braised in tomato sauce, and like it, a lot. This version looks really interesting — more like an “American” meatloaf, although the mozzarella isn’t something I’ve seen before. Great idea! Recently someone served me an Italian-style meatloaf that included Italian sausage. Sounds like it would work, but it wasn’t quite right. At least to my taste buds. Good, but IMO not a winner. Anyway, this looks excellent — thanks. Interesting. Were the sausages part of the stuffing or mixed into the loaf? I imagine as a stuffing it would be just “too much”, especially if the sausages were left whole, but uncased sausage meat mixed in with the ground meats would give a nice extra flavor to the loaf. I do love meatloaf! Your Italian Polpettone looks irresistible. I’m pinning it to try sometime. Please do, Kath. And let us know what you think! Angelina’s recipe sounds wonderful. I bet it is a bit tricky to brown and keep it together — we’ve never tried it that way. I love the variations mentioned above and the little surprises found inside. We recently added polpette to our Italian wedding soup. Mamma would even make polpette out of the meat she used to make brodo. Nothing got wasted! I’m sure most of the nutritional value was in the brodo but the polpette in sugo were delicious nonetheless. Buona Dominica, Frank. Next time I make beef broth I may just try making a polpettone out of the boiled meat. I usually have it as is, with some green sauce on the side, or perhaps rifatto with onions or as a “picciapò” in a tomato sauce. Mio nonno materno era italiano e ha preparato i cibi italiani. La versione quello e fatto era come questo di Marian. Grazie molto! Tornero 🙂 Buona domenica ! My mother made the polpettone with both the mozzarella and the hard cooked egg. Her method to get both the browned crust and an unbroken unit was to make individual servings. We loved the personal mini meatloaves. il polpettone è uno di quei piatti che “fanno famiglia”, mette d’accordo tutti e si presta a svariante versioni, mi segno questa tua, il formaggio all’interno è molto sfizioso ! Buon we Frank ! I love polpette and polpettoni. When I had my restaurant, polpette al sugo was sometimes on the menù and it was a hit all the time. What I like of polpettone is that one can really make it the way she/he wants: it can be rustic, elegant, simple, over the top ecc…. I tend to add some sausage meat or chopped mortadella, sometimes raisins, sometimes it has a souther Italian accent when I use pecorino ecc… when I want to make a more elegant version, I spread the mix onto a wet piece of parchment paper, which I then cover with slices of prosciutto and spinach, blanched and “ripassati nel burro” (saluted in butter), I then wrap up the whole lot and bake it in the same parchment paper. when u cut it, it looks pretty. I tried the Artusi’s versione of polpette/polpettone that are simmered in broth and then the sauce is enriched with an egg and lemon liaison (in fricassea): excellent!, especially in spring, when one can also put cooked asparagus inside the loaf. I am not a great meat eater, but these truly home cooking dishes I love and I think express Italian cooking at its best (of course, one does never find them in restaurants, at least in Italy- apparently, I was reading, one of Batali-Silverston-Bastianich’s Mozza’s top dishes are indeed their meatballs!). All those variations sound fabulous, Stefano. With spring coming soon, I’ll be sure to try Artusi’s version with your suggestion for asparagus inside. It does sound excellent! Also like your idea for using parchment paper to help form the loaf. Brilliant!